Burundian refugees find refuge in Kashojwa village, Nakivale settlement, Uganda. 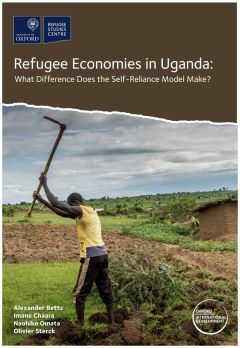 Today, we publish a new report and RSC Research in Brief focusing on Uganda’s self-reliance strategy for refugees and asking ‘what difference does it make?’ Uganda gives refugees the right to work and freedom of movement through its self-reliance model. The model has been widely praised as one of the most progressive refugee policies in the world. New research by Alexander Betts, Imane Chaara, Naohiko Omata, and Olivier Sterck for the Refugee Economies Programme, funded by the IKEA Foundation, explores what difference the self-reliance model makes in practice. Which aspects work, under what conditions, and for whom? In order to answer these questions, they compare outcomes for refugees and host community members in Uganda and Kenya, neighbouring countries with contrasting refugee policy frameworks. They identify four major advantages to Uganda’s regulatory framework: greater mobility, lower transaction costs for economic activity, higher incomes, and more sustainable sources of employment. Nevertheless, there are some limitations to Uganda’s assistance model, notably in relation to the viability of its land allocation model in rural settlements, the inadequacy of access to education in the settlements, and the ineffectiveness of urban assistance. Overall, the research offers a strong endorsement of the value of allowing refugees the right to work and freedom of movement, but calls for a more nuanced view of the strengths and weaknesses of refugee assistance in Uganda.